The retro feel of the piece and vintage knobs invite interaction. This retro-styled interactive work playfully explores the power of words in a relationship, where individual characters are significant. From the lyrical to the absurd, unexpected changes evoke suddenly powerful imagery. The piece explores the ephemerality of our emotions as well as the internal process of meaning-making that defines our evolving relationships to the people we L-O-V-E. or is it M-O-V-E? The vintage radio knobs invite viewers to interact with this hand crafted maple and cherry work. 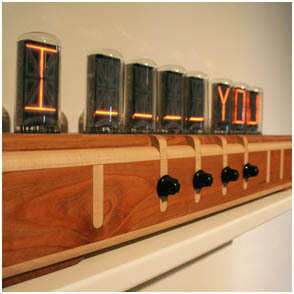 The four letters they select are displayed on vintage Nixie tubes: a message to a loved one, perhaps, or simply a fanciful thought. Then, one by one, the letters begin to change, revealing unexpected subtleties of the English language. The transitions demonstrate the power of small changes to make a big difference, in both relationships and language. At times poignant, humorous, creepy, or absurd, the sequences are in fact just the random musings of a computer. Or are they? From Me To You was an invited contribution to Come Up To My Room 2007, the annual alternative design exhibition at The Gladstone Hotel in Toronto, February 23-25, 2007.